Small businesses need all the help they can get when it comes to taxes. Tax laws are complex and they frequently change. That’s why it’s important to do your research and consult with a variety of tax resources. Before filing your taxes, make sure you’re aware of the many tax credits and deductions for which you may be eligible. Tax credits reduce the amount of money you owe on your taxes on a dollar-to-dollar basis. Here are some that you should consider. Employer Wage Credit – If you have employees who are active members of the Uniformed Services, you may be eligible for this credit. Disabled Access Credit – This credit is for businesses that provide access to disabled people. Child Care Credit – If you provide childcare for employees, which can either be at your place of business or contracted with an external childcare center, you may be eligible for an Employer-Provided Childcare Credit. Work Opportunity Tax Credit – This credit was created to encourage businesses to hire employees from groups that often have a difficult time finding work, such as long-term unemployed, people on government assistance, ex-cons and military veterans. Retirement Plans Startup Costs Tax Credit – If you’ve created a qualified retirement plan for your employees, you may be able to collect a credit amounting to 50% of your costs. Small Business Health Care Tax Credit – This is a tax credit for businesses that provide health insurance for their employees. Federal Empowerment Zone Employment Credit – If any of your employees live in an area designated as an Empowerment Zone, you can receive as much as $3,000 credit per employee. These are areas considered to be economically disadvantaged. Indian Employment Credit – This credit is for businesses that employ registered members of Indian tribes and/or people who live on an Indian reservation. 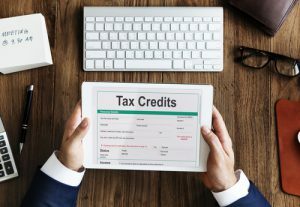 If you meet the basic requirements for any of these tax credits, it’s worth doing more research to find out if you’re eligible for any of them. Tax deductions lower your taxable income. Here are some business deductions that not all business owners are aware of. Retirement Plan Contributions – Retirement contributions may be deductible, depending on the type of business you have and the size of your contributions. Wages and Payroll Taxes – If you are categorized as self-employed or a sole proprietor, you can’t deduct payroll taxes because you’re not considered an employee. However, if you are designated as a C Corporations or S Corporations, you save money on self-employment taxes and can deduct payroll taxes. Interest – If you borrowed money to start your business, the interest you pay can be deducted. The same is true if you loan money to your own business. Startup Costs – Many costs associated with starting a business are deductible. this includes hiring experts such as CPAs, attorneys and consultants. Also eligible are travel expenses, meals and entertainment that you spent at meetings or other business-related events. Health Insurance – Some business owners are eligible for a self-employment health insurance deduction on their personal tax returns. Make sure that you’re actually eligible for these small business tax credits or deductions before claiming them. The IRS has many useful online tax resources to help you. Consulting with an accountant or other tax professional is also a good idea if you want to make sure you’re saving as much money as possible on your taxes. If you’re looking for cash flow solutions for your small business – invoice factoring might be a good financing option for you.